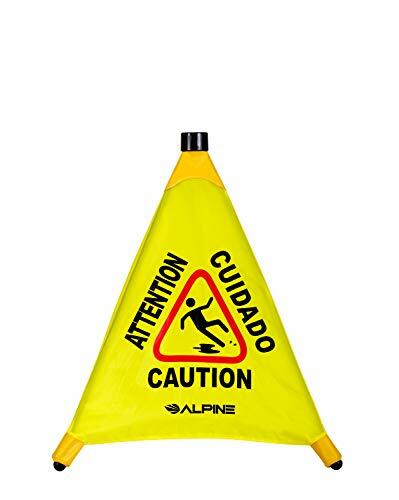 Use Alpine Industries Pop-Up 3-Sided Safety Cone Wet Floor sign with its ANSI and OSHA-compliant bright yellow color and graphics on durable fabric panels to alert customers, and employees of any hazardous wet floor areas to prevent accidents. The snug Velcro strap bands legs together allowing quick insertion/removal from the clearly marked wall mounted storage slot. Item ships with hardware for wall mounting. DURABLE CONSTRUCTION. Providing long-lasting strength, this Wet Floor Sign is expertly crafted out of waterproof, polyester taffeta fabric and comes with a steel, wall-mounted holder for easy storage and use. SAFETY WARNING. ANSI- and OSHA-compliant, this sign is furnished in a bright yellow color with "CAUTION" in bold black text and graphics on each panel to alert customers and employees of any hazardous wet floor areas to prevent accidents. PREVENTS INJURIES. Slipping and falling on a wet floor can lead to sprains, back and neck injuries, and broken bones, not to mention lawsuits and worker's compensation claims. Using this sign can prevent injuries by alerting others to a potential hazard. VERSATILE USE. Floors and other surfaces can become wet from spills, mopping, leaks, rain and other short-term causes. Suitable for indoor and outdoor locations, this sign can be used in a workplace, grocery store, industrial site and retail locations. CONVENIENTLY SIZED. The 20-inch sign features a pop-open, tri-corner design for quick hazardous condition marking in any space. Additionally, a Velcro strap securely bands the legs together for compact storage and easy removal. If you have any questions about this product by Alpine Industries, contact us by completing and submitting the form below. If you are looking for a specif part number, please include it with your message. 3 Sided Wet Floor Sign English/Spanish 3 Pack! !